Spring is here and pastures are growing, which is exactly what our calf market needed after coming through such a tough winter. As I write this article (April 10, 2019), we are at our typical seasonal highs in the calf market, but I expect this market to hold well through summer. For the first week of April, 550 lb M/L #1-2 steers were selling in the mid-upper $150’s on a state average basis (see figure 1). At the same time, larger groups of calves were moving in the $160’s. While the calf market has risen by roughly $15 per cwt since its December lows, I’m actually surprised that calf prices aren’t higher. As I write this article, fall CME© feeder cattle futures are trading in the $158-$160 per cwt range. Using this to make a Kentucky price estimate for fall and subtracting estimated costs for a stocker operation between now and then, suggests higher than normal profit levels for a summer grazing program. Greg Halich and I discussed this in our summer stocker outlook last month in the Economic and Policy Update at http://www.uky.edu/Ag/AgEcon/pubs/extbluesheetMar1920.pdf. And, it’s worth pointing out that futures are actually higher now than they were when that article was written last month. 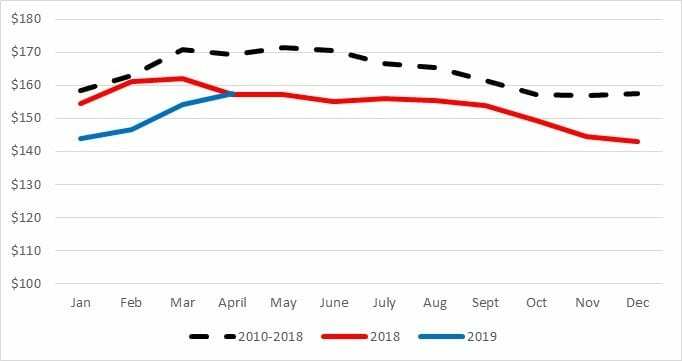 I definitely think that the challenging conditions this winter have had an impact on our forages this spring and may partially explain why stocker operators have not bid the price up calves up as much as usual this spring. Regardless, I see some opportunity there for stocker operators looking to place calves now. It’s impossible not to think about the devastation that many cattle producers in the Midwest and plains continue to deal with. The economic losses incurred by many individuals are hard to fathom. Naturally, I have been getting a lot of questions about the potential market impact of the flooding. To understand this, we have to have understand the supply impacts and there is no way to know those at this point. There have been some numbers tossed around about cattle losses, but there is nothing definitive. Typically, the overall market impact of localized natural disasters is small because natural disasters usually impact a small percentage of the total US cattle supply. However, the flooding has appeared to be very widespread and has had the potential to impact a lot of confinement-type operations. Both of those factors will increase the potential for market impacts. Darrell Peel, my counterpart in Oklahoma recently discussed the impact on feedlot performance, which is another supply impact that often gets overlooked. The futures’ market likely provides our best estimate of the potential market impact at this point. There was a pretty clear increase in CME© feeder cattle futures starting around March 15th and lasting for about ten days. In my opinion, this is primarily due to the markets trying to incorporate this impact into feeder cattle prices. Both spring and fall contracts were affected and increased by about $6-7 per cwt. However, the spring contracts (using May as an example) have given back nearly half of the increase for a net change of $3-4 per cwt. Conversely, fall contracts (October for example) have largely held this increase, suggesting a price impact of $6-7 per cwt. As I write this, the October CME© feeder cattle futures contract is trading at a $13 premium over the April. Part of this is seasonal, but I also think the impact of the flooding is adding to this seasonal expectation. Put simply, the board is suggesting that heavy feeder cattle prices are going to increase significantly throughout the summer. I think this is another reason why calf prices have not reached levels that I would have expected this spring. It is very likely that feeders coming off of grazing programs this fall will sell at higher prices than those same feeders in the current market. So, producers need to be aware of this as they make management decisions over the coming months. Posted by Smith at 5:03am April 15, 2019 Posted in Uncategorized. Bookmark the permalink.